Steve Letarte summarized it up nicely on Sirius XM NASCAR Radio’s “The Morning Drive” this week: Winning is Better Than Losing! Kevin Harvick, who just sold his 110.5 acres adjacent to his North Carolina estate for $3.2 million, is set to make his 500th Cup start. Harvick, a NASCAR Sprint Cup Chase driver, is scheduled to make his historic career NASCAR Sprint Cup Series (NSCS) start in Sunday's AAA Texas 500 race at Texas. In the midst of his 14th season in the series, Harvick has earned 26 wins, 111 top fives, 226 top-10 finishes and 14 pole awards. This weekend the #4 Budweiser Chevy will feature a special 500th start logo on the hood, under the right taillight and on the base of the b-post in recognition of the milestone. In addition, the hashtag #TexasToast appears on the car's decklid (Budweiser Racing). Michael Waltrip and dancing partner Emma Slater earn a 36/40 after their rendition of "The Devil Went Down to Georgia" by Charlie Daniels on DWTS. Bubba Wallace (Darrell Wallace, Jr. born October 8, 1993 in Mobile, Alabama), is a development driver for Joe Gibbs Racing. He currently competes in the NASCAR Camping World Truck Series, driving the No. 54 Toyota for Kyle Busch Motorsports. He is third in the point’s standings and well within striking distance, being only twenty-two points behind the series leader. With three races remaining in the season, Bubba leads the series in 2014 wins with three trips to victory lane. 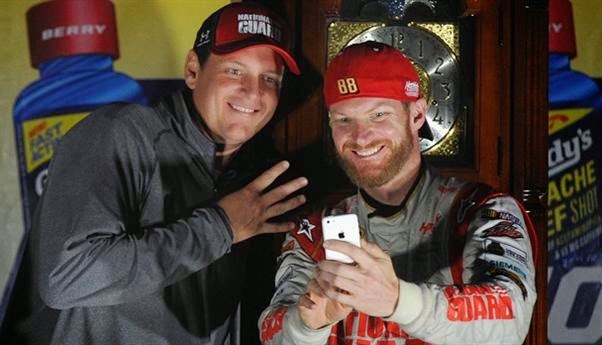 The headlines shriek the news that Bubba won another clock trophy in Martinsville. Wallace led 97 of the 200 laps and started the race from pole. 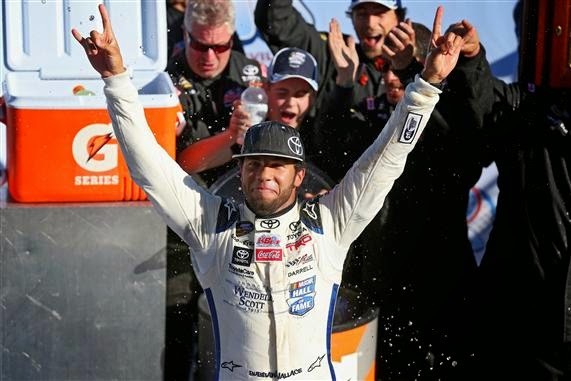 What makes this win just a tad more notable is the fact that the African-American driver won the Kroger 200 NASCAR Camping World Truck Series race in a #34 tribute car to NASCAR Hall of Fame 2015 inductee, Wendell Scott. 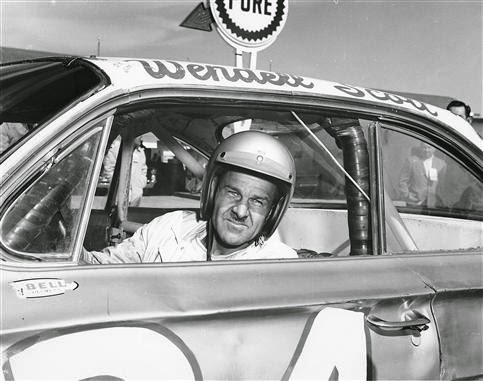 Just in case you are not a NASCAR Nut and unaware, Wendell Scott, who died in 1990 was the first of his race to become a full-time competitor in what is now known as the Sprint Cup Series. From the age of thirty-nine to the age of fifty-one, Scott competed in four hundred and ninety-five races. Wendell Scott’s historic win came on December 1, 1963 at Speedway Park in Jacksonville, Florida. He won the hundred-mile feature race after starting fifteenth. Of his win yesterday, Wallace exclaimed excitedly, “That was so fun. Martinsville is my favorite place to come to. Without the support of NASCAR and Toyota… the whole Wendell Scott family is here and this is a special moment, just a perfect weekend for us. It's a true honor to have Wendell Scott on our Toyota Tundra and to be able to put it in Victory Lane. I know he (Scott) just said up there, 'Hell yeah.' This is cool." 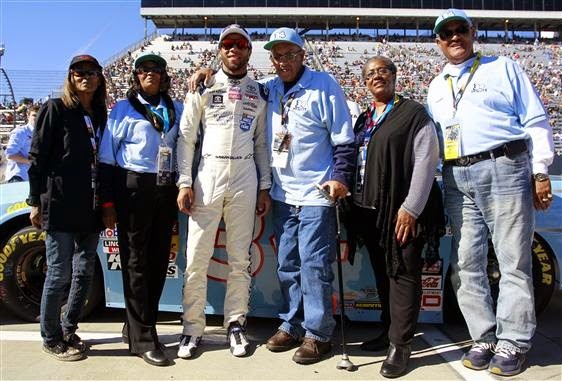 Darrell Wallace, Jr.’s family has always been there to support him also. 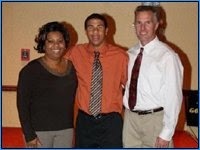 His father, Darrell Sr., is Caucasian, and his mother, Desiree, is African American. 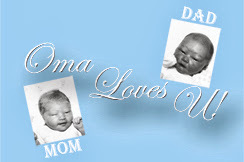 They have both worked diligently to provide their son opportunities, both financially and emotionally, during his accelerated rise through the NASCAR racing ranks. During that journey, the Wallace family was no stranger to the bigoted views of the small-minded. When his son was just fourteen years old and running late models in North Carolina, Darrell Sr. heard an official describe his son as "that n----- kid." Wallace Sr., calmly approached the official and asked, "Did you forget my son's name?" 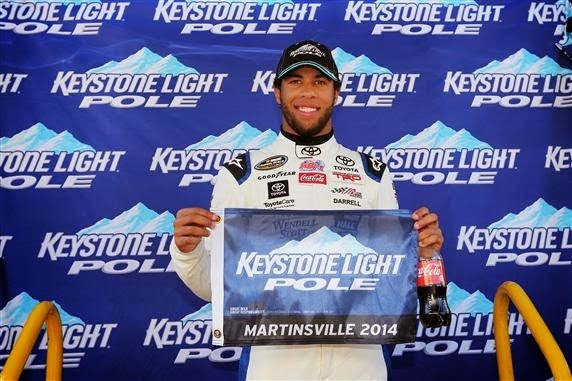 While the younger Darrell Wallace doesn’t want to be known as an African-American driver, but he does like the ability to open minds and help NASCAR become more diverse. When he hosted the NASCAR Instagram account at the 2014 Black Entertainment Television (BET) Awards, Wallace had to field some racist posts. He did so without anger. “I moved on and enjoyed the show. … Kill them with kindness, that’s all you’ve got to do. There’s no point in calling anybody out; that would be a never-ending process.” Wallace responded. In previous interviews, Bubba has made it clear that while he accepts the responsibility of being one of the first African-American NASCAR Drivers; he want his legacy to be measure by his driving talent. If you have any doubt about his sincerity and capability of that goal, please re-read the first two paragraphs. Desiree, Bubba and Darrell Sr. This writer anxiously awaits the epoch when athletes are no longer describe by their ancestry but by their dedication, heart, and talent. When that happens, NASCAR Race Mom will still be reporting on Darrell “Bubba” Wallace, Jr.
Darrell Sr. and Desiree Wallace did an awesome job raising a winner. This video will get you pumped for the start of the Eliminator Round this Sunday at 1:30p.m. ET on ESPN! 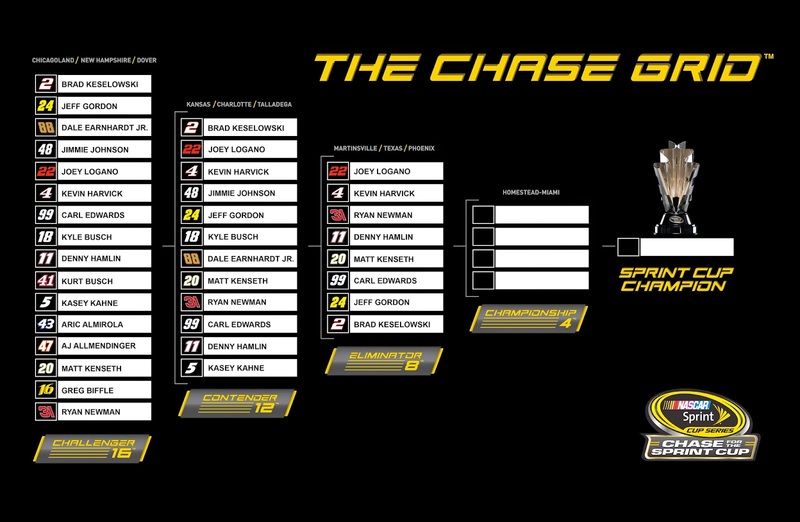 This coming weekend will kick off the Eliminator Round of the Chase for the NASCAR Sprint Cup Championship. This new competition format has placed renewed prominence on the desirability of race wins. It has also increased the unpredictable nature of the championship outcome. Who could have predicted, just a few weeks ago, that three of the four Hendricks Chase Drivers (Dale Jr., Johnson and Kahne) would eliminated in the Contender Round? More surprisingly, Kyle Busch, who started the Talladega relatively safe, needing just a twenty-fourth place finish to secure a berth in the next round, fell seven points short. 'Cause we're still here. You got as good a shot as anyone. Denny Hamlin observed. I doubt anyone had these exact eight in this position right now. But we're going to three very different racetracks than what we race most of the year. We all have the same amount of points. Really there's 30 restarts, 30 pit stops that are going to happen between now and Homestead. One could define, to the good or the bad, of you racing for a championship at Homestead or not. 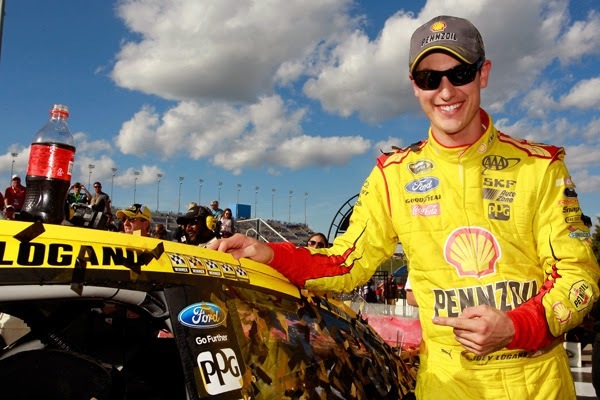 What is assured, is that there are so many variables in the 2014 NASCAR Sprint Cup Chase, the fans will be on the edge of their seats wondering if their favorite driver can persevere to move on to the Championship Round in Miami. I guess for us, we look at it as an opportunity, Carl Edwards philosophized. We’re tied for the points lead with a team that has not been really dominant this year. We look forward to these three races because they're not all mile-and-a-half's on which we've struggled. We feel like Martinsville and Phoenix are probably our best opportunities to get a win and advance to Homestead. A Chase driver who wins one of the next three races will automatically clinch a spot in the NASCAR Sprint Cup Championship race at Homestead-Miami Speedway on Nov. 16. The rest of the four-driver field to compete for the title in the season finale will be determined by the points scored in the three Eliminator Round races. 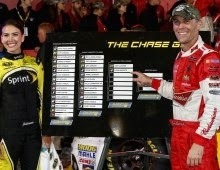 The highest finisher among the four finalists at Homestead-Miami Speedway will win the NASCAR Sprint Cup Championship. Points note: In the final race, the four remaining chase drivers will start the race tied and there will be no bonus points for laps led, etc. 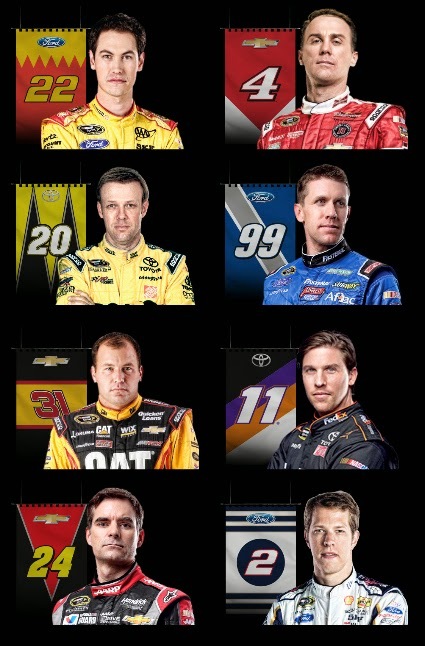 The highest finisher among that group will become the 2014 NASCAR Sprint Cup Champion. 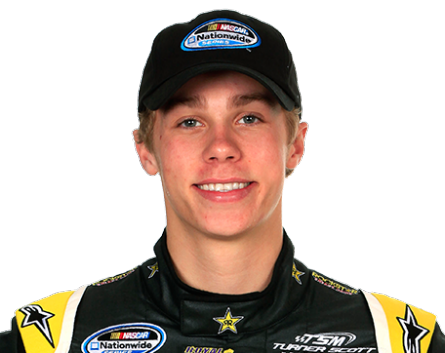 Spotlight Country caught up with 19-year-old stock car driver, Dylan Kwasniewski. Kyle Larson Talks NASCAR’s Sprint Cup Series, Sunoco Rookie of the Year, Hula-Hooping, And More! 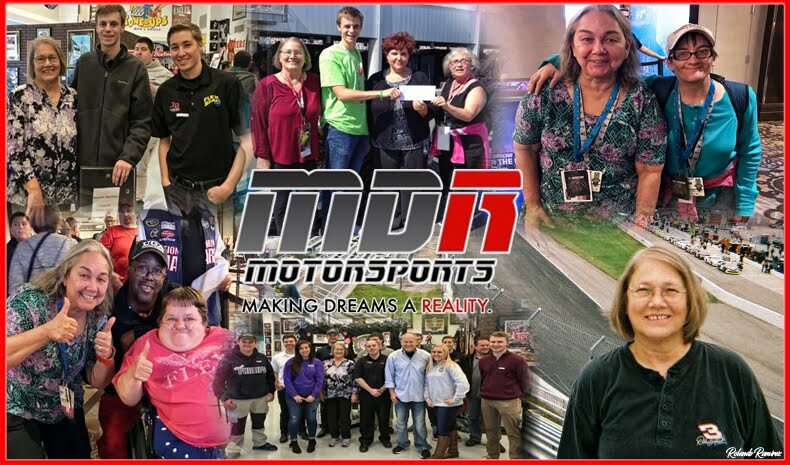 Fan4Racing.com’s Sharon Burton discusses good sportsmanship and respect in sports, and adds her thoughts on the incidents that occurred after the race at Charlotte Motor Speedway. Gaston and Conner Kearby had a very busy and productive October. Both, father and son drive for GK Motorsports, based in Corpus Christi, Texas. GK Motorsports is an integrated, multi-platform racing enterprise founded in 2012 by Gaston Kearby. It currently competes in the IMSA TUDOR United SportsCar Championship and SCCA, NASA and SVRA series of road racing events. Its brief but rich history includes fielding NHRA Pro Stock drivers Erica Enders-Stevens and Dave Connolly, and AMA Pro XR1200 riders Kyle Wyman and 2012 Champion Michael Barnes. 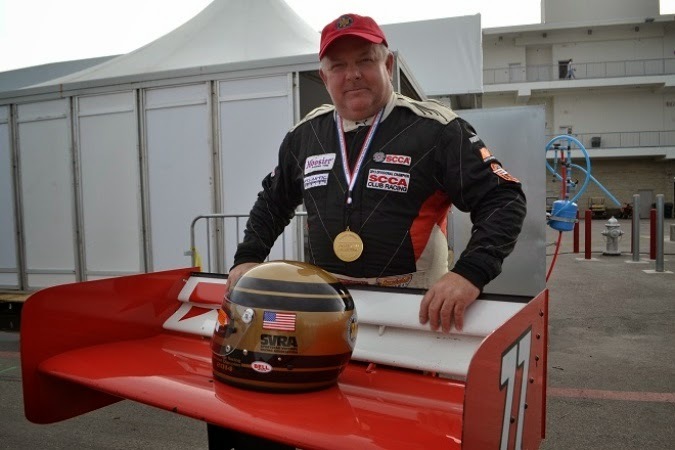 When the Sportscar Vintage Racing Association wrapped up its 2014 National Championships race weekend on October 12th, Gaston Kearby was honored to be the recipient of a Bell Helmet National Championship Trophy. "I'm pumped – this is a really great award," Kearby said. "Tony Parella has done wonders with this series and this Bell Helmet Trophy is a brilliant idea." At the Circuit of The Americas, Gaston piloted his 1997 Indy Lights Lola to victory in Group 9. That field that included Indy cars, Formula 2 and Formula 5000 machines. 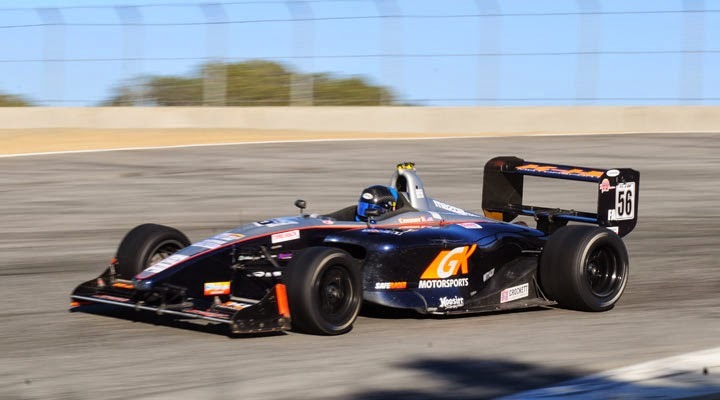 The same week Conner Kearby, was occupied at the Mazda Raceway Laguna Seca with the 2014 SCCA National Championship Runoffs. 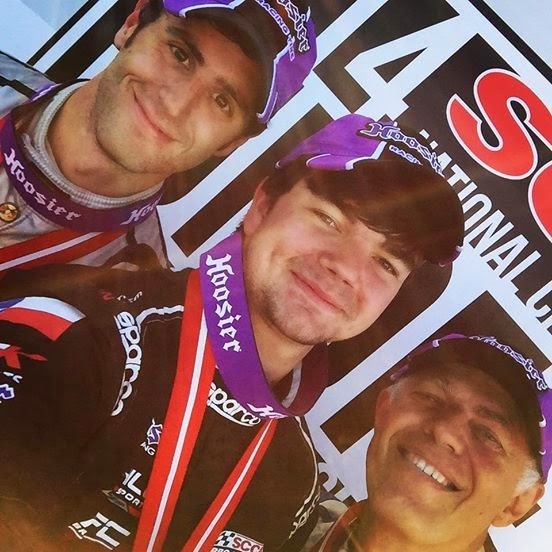 At seventeen years old, Conner had become the youngest winner of this year’s SCCA National Championship Runoffs® by claiming the Formula Atlantic win. Not to be out done by his father, Conner Kearby maneuvered his No. 56 GK Motorsports Swift 016a Mazda from sixth on the grid to third in the opening lap! I really didn’t anticipate any of it, the younger Kerby reported. I went with the green and I saw Sedat take off and thought I could follow him. I went in with him on the inside because I was starting on the outside and this isn’t a good track to start on the outside. I followed Sedat in there, got a good move, didn’t hit anyone and it was a pretty clean start for all of us. I ran my race, set a pace and went with it. and Third Place Bruce Hamilton. Kearby’s error-free race netted him his first Runoffs’ victory in only his second appearance. His triumph from sixth on the grid to victory also earned him the Sunoco Hard Charger Award and the GoPro Hero Move of the Race Award. Most importantly, Conner is now also eligible for the Mazda SportsCar Racing Academy Club Racer Shootout and a $75,000 ride in the 2015 SCCA Pro Racing Mazda MX-5 Cup! celebration back in Corpus Christi, Texas! You can follow GK Motorsports on Facebook. Do you live near the quarter-mile oval of Havasu 95 Speedway, in Lake Havasu City, Arizona? If you do, do not miss the opportunity to watch NASCAR Nationwide Rookie Dylan Kwasniewski return to competition in the Lucas Oil Modified Series presented by LoanMart*. 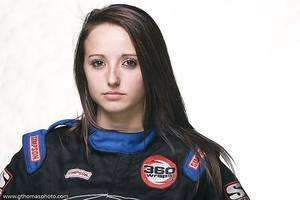 The teenaged NASCAR ‘Rising Star’ is capitalizing a rare weekend off from the NASCAR Nationwide Series to race with the Lucas Oil Modified regulars in the Best in the West 75 presented by Hoosier Tire West tomorrow night. Kwasniewski, the only driver in NASCAR history to win both the K&N Pro Series West and East championships (2012 ,2013), is eleventh in the point standings in his rookie season in the Nationwide Series for Turner Scott Motorsports. Dylan is an incredibly talented young driver. He’s an asset to any series and we’re delighted to have him back with us this weekend,” Lucas Oil Modified Series promoter Greg Scheidecker said. Kwasniewski will be driving the 9X car for Chris Bray’s Phil’s Phabrication team. The spectator gates will open at 4 p.m. and racing gets under way at 6 p.m. Tickets are $12 for adults, $10 for seniors, handicapped and military and $6 for children and juniors 6 to 16. *The Lucas Oil Modified Series presented by LoanMart is supported by a potent marketing concept known as “Team Lucas” whose members include General Tire, GEICO, E3 Spark Plugs, Optima Batteries, Ole Smoky Moonshine, iON Cameras, Speedco Truck Lube and Tire, BILSTEIN Shocks, LoanMart and SuperClean.Detailed information on the series is available at www.LucasOilModifieds.com. Drivers moving on to the Eliminator Round in the new Chase Grid format will make a special appearance at the NASCAR Hall of Fame for Eliminator Media Day on Tuesday, October 21, 2014. The drivers will participate in media interviews and a fan Q&A. NASCAR Hall of Fame members will have the chance to be part of a Driver Nation and receive an exclusive group photo with a driver. The PEAK Stock Car Dream Challenge is a contest that consisted of several challenges such as exhibiting car control on a skidpad, displaying short track skills on the Charlotte Motor Speedway quarter-mile, learning to adapt by running a Dirt Late Model at The Dirt Track at Charlotte Motor Speedway, a test of endurance in a go-kart race, hot laps on the main Charlotte Motor Speedway race course, running laps on street cars at the Charlotte Motor Speedway infield road course, going through the pits for a live pit stop and demonstrating marketability. After submitting a video entry, PaHud was selected from a pool of hundreds of aspiring racers to compete as one of eighteen finalists under the guidance of NASCAR Drivers Michael Waltrip, Clint Bowyer, Brian Vickers, Danica Patrick and Jeff Burton, for a chance to win a PEAK racing sponsorship. Christian PaHud is a third generation driver who has committed his life both on and off the track to racing. Residing in North Carolina, he currently races stock cars in the Southeast Limited Late Model Series and is pursuing his Associates Degree in Applied Science. He started his first go-kart race on his fourth birthday, and worked his way up through legends cars and late models. He has more than 250 career races under his belt. 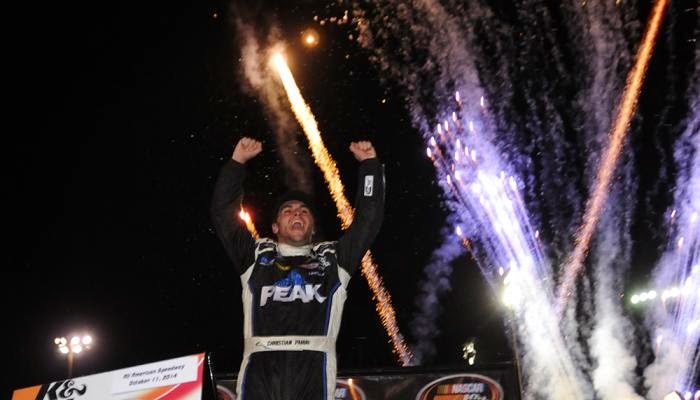 However, winning the PEAK Stock Car Dream Challenge is the highlight of his career. His prize included the opportunity to become the next PEAK Stock Car Dream Driver and compete as a competitively licensed driver in a PEAK-sponsored stock car in a sanctioned race. (ARV $12,000). Unbelievably, PaHud, who is twenty-one years old, converted that opportunity into his first NASCAR victory by winning the Toyota/NAPA Auto Parts 150 at All American Speedway. To top it off, he started off the day by winning the Coors Light Pole Award! PaHud led twice for a race-high fifty-nine laps. He took the lead for good from series regular Brandon McReynolds on a Lap 126 restart. Then in a race which featured six lead changes, the 2014 PEAK Stock Car Dream Challenge Winner held off a late charge by ‘Sunoco Rookie of the Year’ James Bickford to claim the victory. PaHud drove the No. 99 PEAK Toyota for Bill McAnally Racing to make his NASCAR dream come true. Michael Waltrip finished the race in tenth place. The NASCAR K&N Pro Series West visits All American Speedway in Roseville, California, on Saturday, October 11, 2014. Greg Pursley has a 15-point lead over Dylan Lupton in the championship standings with two events left in the 2014 season. Pursley finished fifth in this event last season while Lupton, in his track debut, crossed the line in 15th. Brandon McReynolds is tied for the series' lead in top-five finishes, 10, through the first 12 events of the season. McReynolds has two runner-up finishes in his last three series’ starts and four podium finishes in his last six starts. David Mayhew leads all current drivers with five top fives and seven top 10s in seven All American Speedway starts. This race will be the 16th series visit to All American Speedway. The track hosted five series events between 1977 and 1982 when it was a quarter-mile oval and nine races since 2008, after it was renovated and became a third-mile track. The series visited Roseville twice each year between 2008-2011 and once each year since 2012. All American Speedway is located at the Placer County Fairgrounds in Roseville, California. It began as a quarter-mile dirt oval in 1955 and was known as Placer County Speedway. It was paved in 1972. • The 15 series races at All American Speedway produced 11 different winners. Eric Holmes, with four wins, and his former teammate at Bill McAnally Racing – Paulie Harraka, with two wins – are the only multiple winners. Twelve different drivers have qualified on the pole in series competition at Roseville. Harraka has the most poles, with three. Holmes has the most top-five and top-10 finishes at Roseville, with seven and eight respectively. Holmes has the most series starts at All American Speedway, taking the green flag there 10 times. The race distance was extended for a green-white-checkered finish in four of the 10 most recent series events at Roseville. Seven of the 15 series races at Roseville were won by the pole winner. Jason Fensler started the furthest back and won, coming from 15th on the grid in 2011. 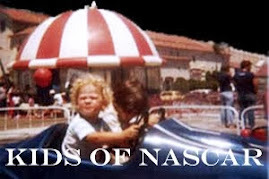 • 138 different drivers have raced in series competition at the fairgrounds track. Patrick opens up about her relationship status with fellow NASCAR competitor Ricky Stenhouse Jr. In tonight's Dancing with the Stars, the celebrities are dancing to songs commemorating their most memorable year. Michael Waltrip talks about 2001 when he won Daytona and when Dale Earnhardt died. 6. Dale Earnhardt Jr. 4. Ryan Newman 2. 7. Jeff Gordon 5. Denny Hamlin 3. 1. 8. Matt Kenseth 6. Kevin Harvick 4. 2. 9. Carl Edwards 7. Matt Kenseth 5. 3. 10. AJ Allmendinger 8. Jeff Gordon 6. 4. 11. Kasey Kahne 9. Kasey Kahne 7. 12. Ryan Newman 10. Brad Keselowski 8. 13. Denny Hamlin 11. Dale Earnhardt Jr.
Fast Facts: The Top 12 drivers will vie for the 8 spots available in the Eliminator Round. Contender Round drivers who win a race in this round automatically advance to the next round. The rest of the Top 8 will be set by points and all drivers who advance will have their points reset to 4,000. 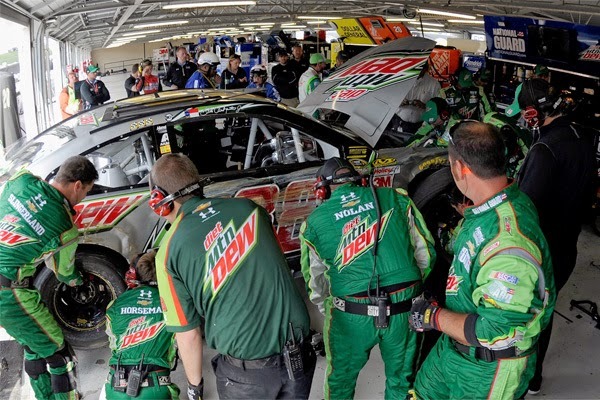 A trio of Chase favorites in six-time and defending champion Jimmie Johnson, 2012 champion Brad Keselowski and three-time 2014 winner Dale Earnhardt Jr. all succumbed to issues relatively early in the race, ending any hope of a solid run at the 1.5-mile speedway. NASCAR Sprint Cup Series Hollywood Casino 400 at Kansas Speedway. Jimmie Johnson tangled with Greg Biffle and wrecked hard at Kansas. A really big hit in the championship points, Johnson said after walking from the infield care center. So we'll try to get the car back on the track, run some laps and get a few points if we can. This just puts a premium on next week and going forward. Dale Earnhardt Jr. wrecked while leading in Sunday's Hollywood Casino 400, scraping the Turn 4 wall hard in the 122nd lap as his right front tire unraveled. I don't know; just the whole surface of the tire unwound like a string, Earnhardt said after emerging from the wreck. It just came off the tire and it popped off the corner. I felt it coming apart through the corner and the surface of the tire is gone. The whole cap came off. Must have been a recap. Brad Keselowski blew a right front tire on lap 160, rocketed into the turn two wall and finished the race in thirty-sixth. We blew a right front tire, said Keselowski, I’m not sure why. We didn’t have an aggressive setup or anything. We just blew a tire. It was just Russian roulette, and it was our turn. Win this 2014 Bristol Motor Speedway Pace Car! Just a $10 donation could win you the 2014 Bristol Motor Speedway Pace Car! The sharks will be dumped into the creek on BMS property on October 11th and will race for 500 yards! will be called shortly after the race concludes on Saturday. 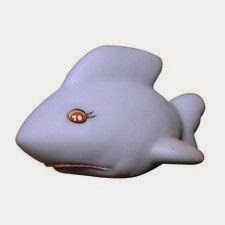 Join NASCAR Race Mom and buy your shark now! The Sharky 500 is a premier fundraising event for Speedway Children’s Charities. You can purchase a shark for $10 and the ticket number will correspond with the number on the rubber shark. 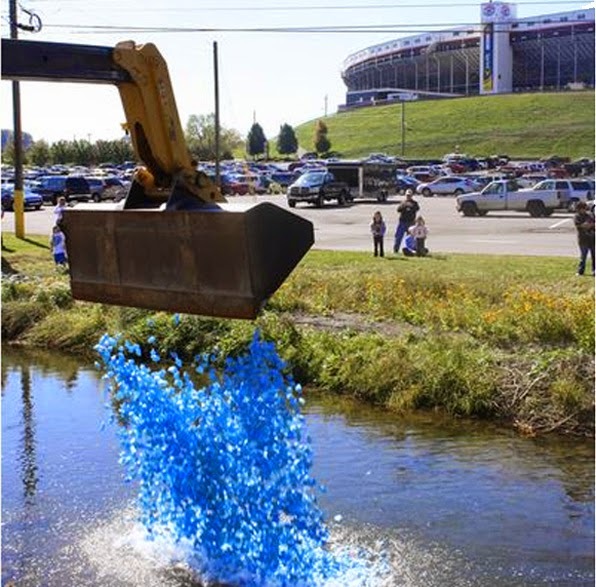 Sharks are dropped into Beaver Creek behind Bristol Motor Speedway to race 500 yards to the finish line where the winner will receive the 2014 Ford Mustang Pace Car. Prizes are also awarded for 2-10 places. 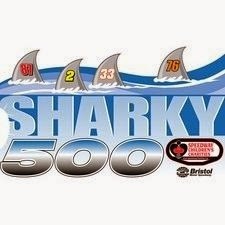 The Sharky 500 and Kids Expo will be taking place on October 11th from 11am- 2pm in hospitality village at Bristol Motor Speedway. The Kids Expo is free for all ages. There will be crafts, games, inflatables and much more for the kids to enjoy. The sharks will drop at 1:30pm. Tickets will go on sale on NHRA Ford Thunder Valley Nationals weekend at Bristol Dragway. Speedway Children’s Charities will be set up to sell sharks all weekend. You may purchase tickets online beginning June 16. 1:30pm - Sharks will be released into Beaver Creek as the start of the Sharky 500!